In 2016, the Central Park Model Yacht Club celebrated its 100th anniversary, making us one of the oldest model yacht clubs in the country. 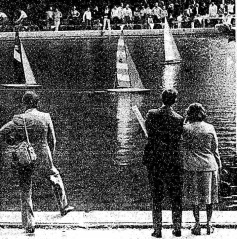 But people have been sailing model yachts on Central Park Conservatory Water for nearly 140 years. Read up on the rich history of our club and sailing venue both here and by clicking ﻿‘Historic Articles' to get to great old write-ups from the US Vintage Model Yacht Group, American Model Yacht Association and other sources. In 1853, New York City acquired 700 acres of wasteland in central Manhattan so overrun with bluffs, swamps, and rocky outcroppings, it was obviously impractical for private development. However, due to a lack of funding the Conservatory was never built and the area configured as a “floral parterre” was turned into a pond called “Ornamental Water” according to Hinrich’s Map of Central Park, dated 1875. 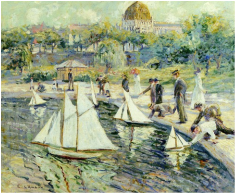 The pond now known as Conservatory Water was inspired by the Grand Basin model boat pond in Paris' Luxembourg Gardens. 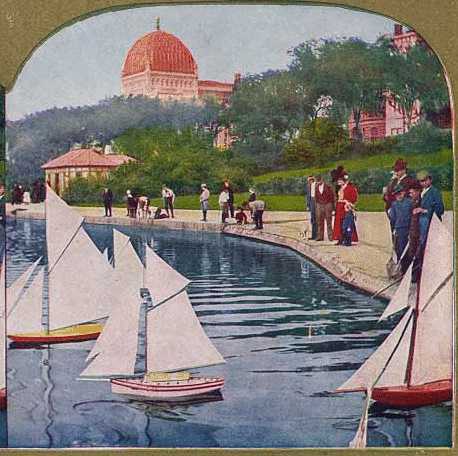 So it's no surprise that following its completion in 1873, Conservatory Water soon attracted a crowd with miniature sailboats in hand. Racing small sailboats was already established in Europe when it was introduced to the U.S.
On Independence Day, 1872, model yachting was initiated on the large lake in Prospect Park, Brooklyn by an organization known as the Prospect Park Yacht Club. Then, in the summer of 1875, a New York Times article reported on "Miniature Yachting in Central Park”. 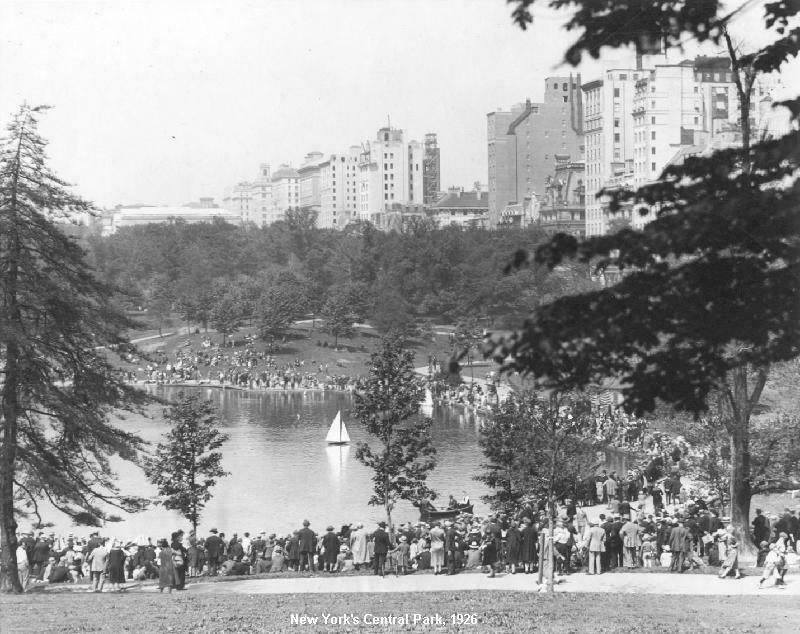 Although it does not mention Conservatory Water by name, it does state that, “On June 19th a field of 13 schooners and 4 sloops raced.” And it goes on to report that “a field of 54 boats fighted on the little lake at Seventy-Second Street." One of those places was at the 1876 World's Fair in Philadelphia's Fairmount Park where a stunning pond boat exhibit caught the attend of hundreds of thousands of visitors. Word was getting out. By the late 1880's the sport was in full swing, principally in the New York City area. There were three clubs there, and they formed the first sanctioning body for inter-club races in the United States: the Model Yacht Racing Union of North America. Back then model yacht racing involved “free-sailing” where boats were directed by using a fixed rudder and adjusting the sails. The skipper would set the boat into the pond, point it towards a finish line on the other side, give it a nudge with a pole and hope for the best. (The woman in the photo to the left was more than likely just posing because in those days woman weren't permitted to take part in such manly activities.) In the late 1800's and early 1900's, a variety of steampunkish steering mechanisms were devised, including Braine and Vane Gear. But even before that, in 1885, the scientist Nikola Tesla developed a boat controlled by a wireless radio controlled system in his studio off East Houston Street just a few miles south of Conservatory Water. According to the "﻿Tesla Memorial Society of New York﻿", he then demonstrated his "robotic boat" in Madison Square Garden in 1898. The newly formed Central Park Model Yacht Club soon became a center of America’s model yachting scene, with members competing against each other and in international championships. One article details a three-day regatta that took place on Long Island Sound's Little Neck Bay in 1922. A month later the local clubs raced against a challenger from Great Britain, W.J. Daniels, a well-know designer and builder of winning model yachts. His book “Model Sailing Yachts” is still popular among vintage enthusiasts. 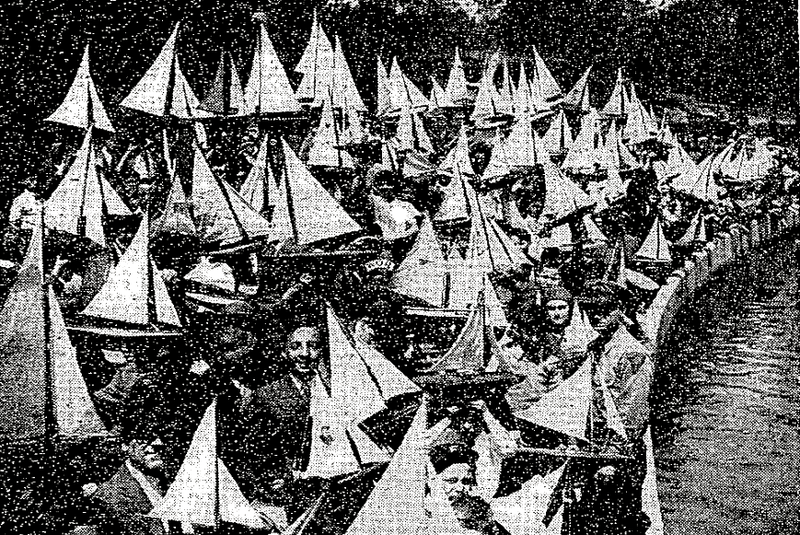 To get a better idea of the momentum that was building around model sailboat racing, in 1926 the New York Times also reported that 200 boys and girls took part in a model yacht regatta at Conservatory Water. But that was nothing compared with what was to come. The History section of our website is a work in progress. We're always looking for info and photos we can add to the site. If you have anything that might be of interest, please email us via our "CONNECT" page. Model yachting reached a peak in the 1930's. For some during the Great Depression it became an affordable replacement for full-size sailing. And within the school systems many shop and manual arts classes built boats as class projects because it involved the marketable skills of woodworking, metal forming and casting, and working with fabrics. Due to this interest race fields continued to increase, reaching several thousand boats! Articles covering the action on Central Park Conservatory Water appeared regularly in the New York Times. The headline below was a real eye-opener and made it quite clear that CPMYC and Conservatory Water had become New York City institutions. In the 30’s, racing power speedboats also became all the rage. But fires, explosions and injuries (to ducks and people) put an end to the club's practice of sanctioning power boat races years ago. Which is not to say that the model yachting community discouraged innovation and change. As mentioned earlier, Nikola Tesla developed a boat sailed via a wireless radio controlled system in 1885. Although it wasn't until the 1930's that the concept resurfaced in an article about a "Radio Controlled Boat Operated By Pressing Button In Box Ashore." The demystification of RC was still decades away. It was no less than sheer wizardry. The tall youngster… pressed a button upon a little box ashore and the boat -- a triangular sail schooner rig model boat afloat upon the water -- changed her course, tacked in an orderly and technical manner, and swung off on the starboard leg of her course. There was of course no one aboard this craft - a model six feet overall - and everything worked "by magic." After World War II, veterans returned to the pond where childhood memories were formed and all was good. Then came the fire of 1952 that burned the club’s boat house to the ground. Although CPMYC wasn’t homeless for long. In 1954 a more substantial boat house was generously financed by Jenne E. Kerbs in memory of her parents Alice H. and Edward A. Kerbs who enjoyed watching the boats on the pond from their Fifth Avenue apartment. After a decline in interest in pond sailing during the late 50’s, Conservatory Water became a microcosm of America in the 60’s and 70’s. New progressive leadership was elected and old rules dictating that members be white, male and at least 21 years of age were abolished. A spirit of openness took hold. Members experimented with new designs and techniques. Technologies advanced, and with it came a tug-of-war. On one side were traditional free-sailing enthusiasts and the club’s national sanctioning body, M.Y.R.A.A. On the other side were those who favored the emerging radio controls and electronic servos. A big supporter of RC sailing was a new sanctioning body, the American Model Yacht Association (AMYA). A fan base developed and CPMYC eventually joining AMYA. Today's elaborate, high-tech models are still completely powered by the wind, but now chance does not dictate the direction the boat will take, the skill of the on-shore skipper with transmitter in hand searching out the breezes and developing the proper tack, makes this determination. The same New York Times article from October 6, 1977 reported on a young skipper who outran the adult competitors and won a national championship on Conservatory Water using Radio Control. That skipper, Jon Elmaleh, has since won multiple national championships, has designed and built many of the IOM sailboats that we race today and remains a very active CPMYC member and trustee. CPMYC has a long record of inventive and forward-thinking members. Many have designed models used for testing theories which were later implemented into full-size sailboats. And in 1985 we became the only model yacht club in the US to elect a female Commodore; Madeline Tucker, who served in that position until 1992. Ms. Tucker's tenure was followed by a second female Commodore, Sherri Duprey. At one point, the three chief club officers were women. In 1992 CPMYC sponsored the Worlds Marblehead Championships, wherein 74 skippers representing 16 different countries from Europe, South America and North America competed. It has been the only time such an event was hosted in this country. The regatta was sanctioned by the International Yacht Racing Union (IYURU) and in attendance was the then chairman of the Union, Norman Hatfield. Over the past 20+ years CPMYC members have continued to compete every Saturday on Conservatory Water. Since 1990 we’ve raced several classes of boats including the 10-Rater, 36/600 (36” overall hull length, 600 sq.inches of sail area) and 50/800 Marblehead, all open class boats that can be built from any material including carbon fiber and Kevlar, making it cost-prohibitive for many who were interested. Hence our move to the fast yet more affordable International One Metre (IOM). As mentioned earlier, our club was originally former in 1916 to “encourage those interested in designing, building and sailing model yachts.” That hasn't changed. Please stop by on a Saturday morning or Wednesday evening, watch us sail, introduce yourself and ask to give it a try.